‘Rivers Class Clips’ is a set of 17 BBC video clips teaching about rivers and suitable for use in KS2. It tends to focus on the effect the rivers have in their locality rather than the geography of rivers. They need Flash to play them so are not suitable for tablets. 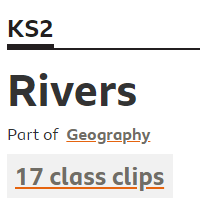 Most of these rivers class clips would fit better into other geography topics than a rivers topic but there may well be one to fit a specific need in your planning! The two most useful of them are about the water cycle, which I have listed first. Clip 7 – Rivers and the Water Cycle. A short demonstration of the water cycle and the journey of a river. This one does look really useful for part of a rivers project. “A short demonstration of the water cycle and the journey of a river. Includes an explanation of how water is stored in dams, and a look at the processes involved in treating water so it is safe to drink.” (BBC Bitesize) It includes a quick look at a huge dam and providing household and drinking water. Clip 16 – The Water Cycle. The water cycle is essential for all living creatures – here it is explained in detail. Clip 1 – A child-led tour of Füssen in Bavaria, in this clip children are asked to compare the life of the child showing the clip with their own lives. There is lots of information about living in Bavaria but not too much about rivers! Clip 3 – Expedition to Guyana – This clip could be used as part of a study on rivers, or life in the rainforest. It shows the river being used as a transport network. 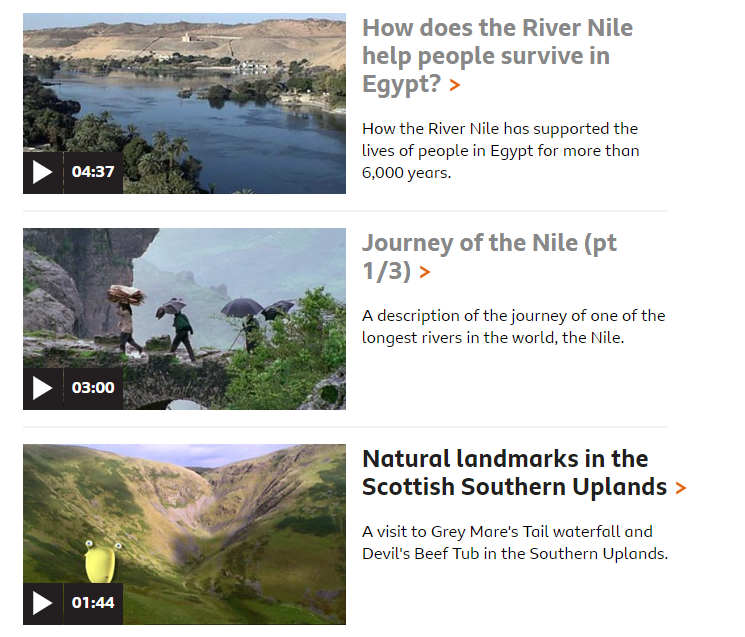 Clip 4 – How does the River Nile help people survive in Egypt? This clip could be used to see how a river can help people live in a very dry land which is mostly desert. It is much more about historical Egypt making use of the river rather than about the actual river. I would use it in a topic on the Ancient Egypt rather than a topic about rivers. Clip 6 – Natural landmarks in the Scottish Southern Uplands. A visit to Grey Mare’s Tail waterfall and Devil’s Beef Tub in the Southern Uplands. Clip 8 – Rivers and waterfalls in Guyana’s rainforests – Views of the rivers running through the rainforest of Guyana. There is no narration on this one. Clip 9 – Stirling and the surrounding area – An introduction to Stirling in Scotland and the surrounding area. Clip 10 – The lower reaches of the River Clyde in Scotland are explored by boat. Clip 11 – The Moray Firth. A Trainee Tour Guide visits the Moray Firth to spot seals and dolphins. Clip 12– The River Clyde, from the source to the sea. A brief look at the features of the River Clyde in Scotland, from source to sea. Clip 13 – The River Forth from source to sea. The origins and course of the River Forth in Scotland. Clip 14 – The River Tweed – wildlife and industry. River Tweed in Scotland has a range of wildlife and also supports the textile industry. Clip 15 – The River Tweed from source to sea. A look at the River Tweed and its course through the Southern Uplands of Scotland. Clip 17 – Tongland Power Station and the River Dee. Tongland Power Station generates hydroelectricity from the power of the River Dee.